Varanus salvator is a large species of monitor lizards. The neck of this monitor is very long with an elongated snout. The nostrils are close to the end of the nose. The tail is laterally compressed and has a dorsal keel. The scales on the top of the head are relatively large, while those on the back are smaller in size and are keeled. The color of the Varanus salvator is usually dark brown or blackish, with yellow spots on the underpart of the lizard. The yellow markings on the species tend to diminish as the individual becomes older. For a good hatchling enclosure I suggest building your own or you can use the custom or pre-made snake/reptile enclosures that are made out of PVC sheeting (Animal Plastics Brand or similar). A good starter size is 0.9 meters wide X 0.7 meters deep X 0.4 or 0.6 meters high (3 x 2.5 x 1.3 or 2 feet). These type of enclosures hold heat and humidity very well and provide security from the back, top and 3 of the 4 sides. One of the only drawbacks to this type of enclosure is they are designed with snakes in mind and usually only have belly heat, meaning that you either have to special order an enclosure with an internal basking lamp or modify the enclosure yourself to make one work. Here at Vital Exotics, I build my own custom enclosures (from hatchling size to adult), I start them out in my 0.6 x 0.6 x 0.9 meters (2 x 2 x 3 feet) hatchling enclosures and then move them to larger sized enclosures as stated in the stages and sizes below. Once your Salvator hits around 6 months old it will be between 0.6 and 0.9 meters (2 and 3 feet) long and require a fairly large enclosure; Something in the range of 0.9 x 1.8 meters (3 x 6 feet) of floor space, with as much height as you can provide. At a year or year and half old you will have a 1.2 or 1.5 meters (4 or 5 feet) lizard in your care and will need to move your Salvator up into its permanent enclosure. A minimum size for an adult Salvator should be 1.2 meters (4 feet) deep by 2.5 meters (8 feet) wide/long and 1.8 or 2.5 meters (6 or 8 feet) tall. The larger the better for these highly active animals, and be sure to take advantage of the space inside the enclosure. Don’t just build a big empty box. Do your animals justice and provide them with as much usable area as possible and you will have a much more active and healthy monitor which will be much more enjoyable to have in your care. An important feature for monitor lizards is hide areas. Monitors, especially when hatchlings and or sub adults, need places that they can retreat to feel secure and rest. An animal with no appropriate hide spots will be very stressed out, effecting its eating patterns and overall survival. I provide numerous hide areas in each enclosure, allowing the monitor to chose which one suits it best at that time. These hide areas should be provided on both the warm side of the enclosure as well as the cool side, to allow your monitor to choose which one it will use depending on its situation. There many options available to choose from for use as substrate, but most of them are not suitable for use with monitors. What you are looking for in a substrate is something that holds humidity, burrows well and provides natural organisms and good bacteria to help keep the enclosure fresh and clean. The suggested “ingredients” for your enclosure Sandy Topsoil + Mulch and or Cypress Mulch + Leaf Litter. Mix it up well, you want a soft, fluffy and moist substrate that should be a minimum of 0.15 meters (0.5 feet) deep for a hatchling up to 0.6 or 0.9 meters (2 or 3 feet) deep for an adult. The deeper the better. When the substrate starting to get packed down or lose the “softness” or ability to absorb or release moisture it’s a good practice to shuffle the top layer. It is believed that due to the diet of whole prey items, monitors receive much or all of the proper vitamins/nutrients needed for proper growth and development without the assistance of UVA or UVB. Many herbivorous reptiles seem to benefit from UVA or UVB but this does not seem to be the case with monitors. In your enclosure you want to provide ambient temps (air) on the hot side of the enclosure or near the higher parts of the enclosure of the 29-32 ºC (85-90 ºF). You also need a “cool” area that the animal can retreat to when is desires lower temps, this area should be 21-22 ºC (71-73 ºF). Providing “warm” and “cool” temperature zones will allow your monitor to choose when and what temp it desires depending on what its needs are. A nighttime ambient temperature drop is acceptable to 23-25 ºC (74-76 ºF), so you may be required to use some form of heating (heat emitter, red heat bulb, etc) to keep your enclosure warm enough at night, when the main basking lights are off and not providing the heat to keep ambient temps high enough. With the new advances in monitor husbandry, basking temps of 48-65 ºC (120-150 ºF) are used successfully with many monitor species. Many new or other reptile keepers are amazed when told that they need to provide basking temps in that range. Numerous bulbs are mounted in a line with 0.25-0.45 meters (0.8-1.5 feet) in between them to provide a larger basking area for longer or adult animals. These animals are designed and hard wired to spend large amounts of time near or in water, so I provide my animals with the largest water feature available to my enclosure. You will see higher animal activity levels, better/healthier skin sheds, better enclosure humidity and all around a better life for your Salvator if they are provided some sort of area to get their full body underwater. You will learn to adjust your enclosures humidity by paying attention to evaporation rates and temperatures and will have to adjust or add moisture to the substrate depending on your enclosures dry out time. You need to keep your humidity levels high as water monitors are a tropical species. Monitors need insect shells, animal bones, fur and feathers to help keep their digestive tracts working properly as well as the nutrients that they supply while being digested. If you are starting out with a young hatchling monitor, It may take a few days to settle in, but food should be available in a somewhat sheltered or secure area at all. For hatchlings up to 1 or 1.5 year olds, I mainly feed appropriate sized feeder roaches (Blaptica dubia, or similar and Madagascar Hissers) every day with properly sized frozen thawed rodents, day to week old chicks or quail and fish offered everyday or every other day also. With proper temps, a young monitor needs to be fed as much as it will eat, at least 5 days a week in order to fuel its high metabolism as well as to sustain the huge amounts of growth that it will be experiencing during the first two years of its life. At one year of age, I feed 2-3 appropriately rats or large chicks and some fish 5 or 6 days a week with large roaches supplemented to the diet daily, all roaches except Madagascan Hissers become too small to justify feeding to your monitor, and rodents, chicks and fish become the staple diet from that point forward. After the monitor reaches three years of age its growth rate in length will usually slow down, although it will still grow 6” to 12” a year if a proper set-up and temps are provided. You will have to watch your animal to determine how much food is appropriate to maintain the activity level and growth, but not feed too much and allow your Salvator to get overweight and lazy. During the first months of its time in your care, limit your interaction and stress on the animal as much as possible. Allow it sufficient time to adjust. Your personal interaction time will come later, once the animal has settled in and you have gained its confidence, primarily through its relation to you thru feeding. Tong feeding is a great way to start to develop trust with the new animal and it is also a great way to interact with a normally positive result for the animal. Also performing cage maintenance without bothering the monitor too much is also a great way to shoe it that you mean no harm. Once the monitor starts to show signs or interest or curiosity towards you, then I recommend small, short periods of gentile handling. Start out handling the animal in its enclosure by allowing it to climb on or inspect your open hand. After numerous times of doing this with positive results (sometimes this takes months), only then do I recommend trying to handle the monitor outside of the enclosure. Once you make progress with handling outside the enclosure, you can continue to interact with the monitor and develop your trusting relationship. 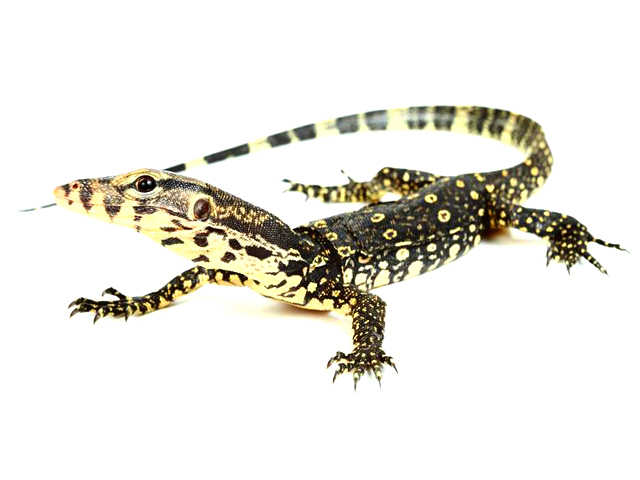 Water Monitors will also almost always defecate in the water and this can be a positive, as daily cleaning of feces in the enclosure is not needed, but this also means you will also be required to change the dirty water to fresh water at least every other day. This is why it is very important to design your water feature so that it is easy to clean and refill. I use large plastic water troughs or heavy duty plastic pond liners as ponds and plumb them with 1.5“ or 2” PVC valves and lines to allow for a quick empty and cleaning. I check the enclosure daily and spot clean it in order to keep the environment healthy for the water monitor.